The amateur actors of this theatre group include a medical doctor, software engineers, corporate executives, students among others. Antraal concluded its tenth anniversary festival last weekend that included two plays. 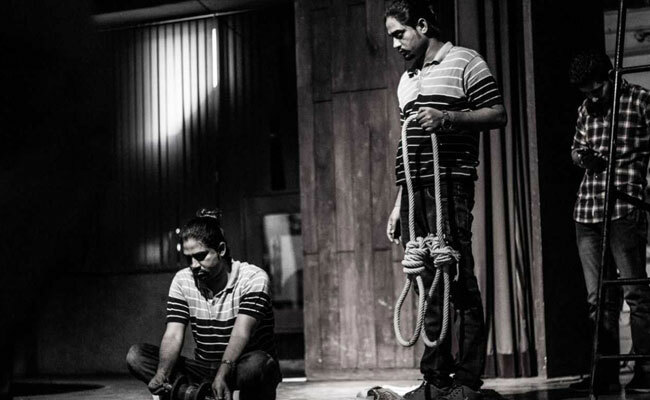 New Delhi: After having wrapped up a two-day theatre festival in Delhi last weekend, Akbar Quadri and his twin brother Azam, have now heaved a sigh of relief. They had put together the event after investing gruelingly long working hours spanning over just 20 days, or even fewer. Their job was relatively difficult not only because the time at hand was short, but also because they had to make the 'amateur' actors perform, and that too professionally. Most of the members of their theatre group, known as Antraal, work in corporate offices during the day time, and out of sheer passion, also do the moonlighting in run up to the plays such as the one that got concluded last weekend. Gurinder Singh, a qualified software engineer by training employed in an IT firm in Gurgaon is one such actor at Antraal. At times, Singh finds the work quite "demanding" when he is compelled to take out time for the rehearsals. But he doesn't have any qualms only because he is profoundly keen to perform on the stage. "We had fewer than 20 days to prepare for our two plays that were showcased in the festival. I used to leave my workplace in Gurgaon 15-20 minutes prior to the scheduled time so as to reach the rehearsals in time," said Gurinder Singh. Gurinder is one of the nearly 30 part-time actors, who work as professionals in their full-time jobs, and get to meet only during Sunday for a theatre practice session in Hauz Khas. Another Antraal actor Nishad Hariom is a doctor in a Delhi government dispensary. About his passion for theatre, he said, "I was keen to take part in theatre and literature but because of studies, I couldn't afford to pursue my passion fulltime. Later, I joined the weekend theatre group to manage professional life while fulfilling my interests too." Not only professionals, even businessmen are also associated with Antraal. One such entrepreneur is Atul Singh, who runs a gym in Uttam Nagar, and also been acting for Antaral Theatre for two years now. Although he happens to make decent money in the fitness business, but when he describes the feeling he gets when he gives a stage performance, he can't think of a word better than "priceless." "For no amount of money, you can buy the feeling you get when people applaud your performance on the stage," said Atul. During a recent performance, Atul felt a surge of trepidation before he spoke his first dialogue. However, that nervousness frittered away as soon as he got into the role of Bairagi, a corrupt cop that he played in Chainpur Ki Dastan. At his gym, youngsters do workouts for physical rejuvenation. But when it comes to the rejuvenation of mind, he doesn't endorse gym workouts, but prefers a stage performance. "After working throughout the week, rehearsals on Sundays are a real treat to the mind," said Atul. "In past two years, we have tried not to skip even a single Sunday. That's only because we love to do this. Out of 25-30 people, atleast 15-20 people do visit on our customary meets in the weekend," added Atul. However, there are a handful of amateurs who wish to carve a niche out of theatre such as the 25-year-old Tasha Jaiswal. He joined Antraal five years ago when he was a college student. But now, after having completed his master's degree in film studies from a Delhi college, he now considers theatre as a stepping stone to achieve professional success. "For me, theatre is a medium to enter the cinema. But it is quite intriguing to work amidst the amateurs who are just passionate about the stage," said Tasha. Although Akbar and Azam Quadri shifted to Mumbai nearly 7 years ago for making a career in Hindi film industry, they are determined to continue running the theatre group in Delhi so as to let these capital-based amateur actors fulfill their creative interests. The show must go on, believes the Quadri duo.